This recipe for beef stew is an adaptation of one Giada de Laurentiis makes on her Food Network show, Giada at Home. Have I mentioned that I am slightly obsessed with Giada? I will save that for a future post, but I really do love most of her recipes and find myself making many of them quite often. What I love about this stew is that it feels lighter than the traditional stew recipes that use potatoes and carrots. It also has great eye appeal because of the vibrant color of the squash. I swapped out Giada’s Marsala wine and sun-dried tomatoes for milder flavors of red wine and diced tomatoes. I like using organic beef for the recipe, but regular stew meat works perfectly well. If you have time, consider peeling and chopping your own butternut squash rather than purchasing pre-cut squash. The flavor will be so much better. I like to serve the stew with some crusty parmesan toasts for which there is no recipe but it goes something like this: Take your favorite bread (slices of good french or sourdough sandwich bread, baguette, etc.) and spread with softened salted butter. Shave parmesan cheese over the entire piece of bread and sprinkle with some coarse black pepper. Bake at 350 in a toaster or conventional oven until crisp, about 8 minutes. 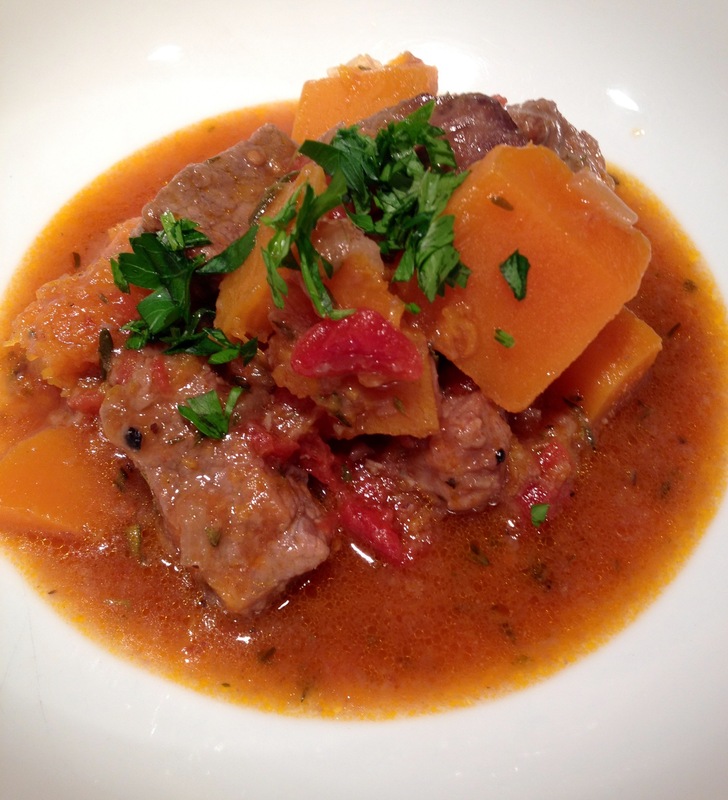 I hope you enjoy this stew before spring warmth arrives! Before you begin, toss the beef cubes in the salt, pepper and flour to coat. Set aside. In a large soup pot, heat 3 Tablespoons of olive oil over medium heat. Add the onions, rosemary and thyme and saute until the onions are tender, about 2 minutes. Add the garlic and saute for just a minute. Add the beef to the pot. Cook until the beef is browned and golden around the edges, about 5 minutes. Add the wine, water or stock. Using a wooden spoon, gently stir up all the brown bits off the bottom of the pan. Add the butternut squash and stir to combine. Add the diced tomatoes and the beef broth to just cover the beef and squash. Bring the stew to a boil over high heat, then reduce the heat to low and simmer, covered, for 1 hour. Season the stew with additional salt and pepper to taste. Sprinkle with the chopped parsely and serve with Parmesan Toasts. like your changes to the recipe….will make this weekend before we are home bound with the next snow storm! Made this last night, Susan. So yummy. I hope you like it. Hi Valerie! I am making this delicious recipe now – fresh Ciabatta rolls at the ready. Thanks!